In the film “Crazy Rich Asians,” Rachel Chu, portrayed by Golden Globe nominee Constance Wu (Fresh Off the Boat), is an optimistic and highly intelligent, Chinese-American economics professor. She has just finished teaching her economics class on game theory, and is on her way to meet her boyfriend, the sophisticated and debonair Nick Young (Henry Golding), at a Manhattan restaurant. During the course of their dinner conversation, Nick invites Rachel to accompany him to his native, Singapore, where he has been invited to attend his best friend’s wedding. The two have been dating for approximately a year, but Rachel doesn’t know a great deal about Nick’s family. The trip will provide Rachel with the perfect opportunity to find out more about him. What neither of them knows, is that someone familiar with Nick, has spotted the two of them in the restaurant, and taken a cell-phone picture, which once sent, is spread everywhere on social media. From that moment, assumptions about Rachel’s intentions concerning Nick are already being formulated, before anyone even takes the time to get to know her. The excursion gets off to an interesting start for Rachel. From the moment she gets on the airplane, instead of sitting in business class, which she expected, or even regular first class, the two are given their own private cabin. Nick merely explains to Rachel, that it is a business perk. As Rachel and the viewer will soon learn, Nick comes from one of the wealthiest families in China, and, because of that, is one of, if not, the country’s most eligible bachelors. The first class cabin pales in comparison to the opulence that Rachel will be introduced to and experience, during the film’s 120 minute runtime, once they arrive in Singapore. Rachel doesn’t get to meet Nick’s father, who is apparently away on business, and from all accounts working himself into an early grave. She does, however, get to meet, amongst other family members, Nick’s mother, Eleanor Young, played by the always competent, BAFTA nominee Michelle Yeoh (Crouching Tiger, Hidden Dragon). From the outset, Eleanor is not impressed with Rachel, who doesn’t come from a prominent family, and wasn’t born and raised in China. Instead Rachel was raised in America by her hard working, single mother, Kerry (Tan Kheng Hua), who gave Rachel, and continues to gives her, unconditional love and support. Eleanor, it is revealed to the viewer, was once like Rachel. She was treated in the exact same manner by her husband’s mother, Ah Ma (Lisa Lu), and considered unworthy, so it’s a shame she employs the same distasteful and condescending behavior. Family is everything to Eleanor, and she is the type of person who engages in antiquated thinking; she can’t reconcile that Rachel can be a success in her career, as well as an excellent wife, and mother if she and Nick choose to have children. Furthermore, Rachel is thought of as a gold-digger, undeserving of Nick’s love by, among other people, his ex-girlfriend, Amanda (Jing Lusi). Rachel does have some allies. One such friend, is her former college roommate, Awkwafina (Peik Lin Goh), who is a real scene stealer. She lives with her family, and her father, Wye Mun, is played by Ken Jeong (Community); Mun and Awkwafina play well off one another, in the lighthearted moments they share on screen. Additionally, Rachel finds two allies in the Young family: One is Nick’s favorite cousin, Astrid (Gemma Chan), who, even though she is extraordinarily wealthy and powerful, treats Rachel as a friend and equal. As it turns out, Astrid, who is married to Michael (Pierre Png), is dealing with her own relationship issues. Even though Michael claims that everything is fine with their marriage, especially Astrid’s vast wealth compared to his earnings, but something is not right, and it will eventually be revealed to the viewer. The other is Oliver (Nico Santos), he comes to Rachel’s aid, helping her to look absolutely stunning at Nick’s friend’s wedding. Will Nick and Rachel be able to get married despite the strong objections of Nick’s mother and others? Is there any way that Rachel can win Eleanor over, so she realizes that Nick is not making a mistake if he marries her? Does Rachel walk away, not wanting to separate Nick from his family? Does Nick, instead, leave Rachel because family means more to him than even love? All of those questions and more will be answered by the film’s conclusion. “Crazy Rich Asians” was directed by Jon M. Chu (Step Up 2: The Streets). The screenplay written by Peter Chiarelli (The Proposal) and Adele Lim (Life on Mars), was based on the best-selling novel of the same name by Kevin Kwan, which was published by Knopf Doubleday on June 11, 2013. The film had its premiere on August 7, 2018 in Los Angeles, California, and since then, has gone on to become the highest grossing romantic comedy in over a decade, having earned well over two hundred million dollars worldwide. 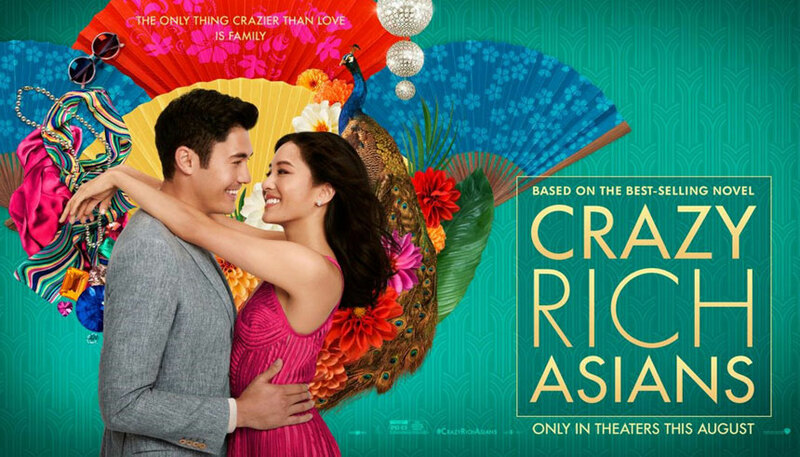 As of the writing of this post, “Crazy Rich Asians 2” which will be based on “China Rich Girlfriend” the second book of author, Kevin Kwan’s trilogy, has been confirmed, but no set release date has been given. I was born in Smithtown, New York, and grew up, worked, and lived in various areas of Long Island before moving to Boca Raton, Florida where I now make my home. In addition to being an aspiring writer, I am also an English teacher. I have a Bachelor of Arts in English and a Master’s Degree in Education, both from Adelphi University in Garden City, New York. In my spare time you will find me engrossed in books, watching movies, socializing with friends, or just staying active. This entry was posted in Movies and tagged Adele Lim, Constance Wu, Crazy Rich Asians, Gemma Chan, Henry Golding, Jing Lusi, Jon M. Chu, Ken Jeong, Kevin Kwan, Lisa Lu, Michelle Yeoh, Nico Santos, Peik Lin Goh, Peter Chiarelli, Pierre Png, Tan Kheng Hua. Bookmark the permalink. I surprisingly enjoyed this movie and its story a lot. Definitely recommended! I thought the book was fun and was glad the movie measured up. I would like to read the book.